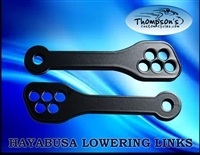 Hayabusa 5 position lowering links can be moved in 1/2 inch increments up to a 3 inch drop. GSXR 5 position lowering links can be moved in 1/2 inch increments up to a 3 inch drop. GSXR 1000 5 position lowering links can be moved in 1/2 inch increments up to a 3 inch drop.